Austin–Round Rock is the 35th largest metropolitan area in the United States, with a population over 2 million people and 16th largest GDP per Capita as of the 2014 U.S. census estimate. The metropolitan area is centered on the City of Austin—the fourth-largest city in Texas and the 11th-largest city in the United States with a population of 912,791 people. Austin's largest suburbs are Round Rock, Cedar Park, Georgetown, San Marcos and Pflugerville. As of 2013[update] the U.S. Office of Management and Budget defines the Austin–Round Rock MSA as including Bastrop, Caldwell, Hays, Travis, and Williamson Counties. The U.S. Bureau of Economic Analysis includes the counties of Blanco, Burnet, Lee, Llano, Mason, and Milam Counties, in addition to the Austin MSA, in its definition of the Austin Economic Area. The Capital Area Council of Governments, an Austin-area intergovernmental cooperative, adds Blanco, Burnet, Fayette, Lee, and Llano Counties to the MSA counties in its definition of the metropolitan area. Other counties in Central Texas included by some sources are Burleson, Colorado, and Gillespie Counties. More distant communities such as Marble Falls, Burnet, Johnson City, Killeen, and Lampasas are sometimes considered part of Greater Austin though they fall well outside the bounds of the OMB definitions. There are over 4 million people in the San Antonio-Austin corridor. The areas in and around Austin have been the site of human habitation since at least 9,000 B.C., and possibly considerably before that. The earliest known inhabitants of the area, during the late Pleistocene (Ice Age), can be linked to the Clovis people around 9200 B.C. just west of Williamson County. But archeology dig sites show a much greater evidence of Archaic Period inhabitants has been recovered from burned rock middens and rock shelters near Round Rock along Brushy Creek, in Georgetown along the San Gabriel River, and in Austin especially near Barton Springs. The earliest known historical occupants of the area, the Tonkawas, were a flint-working, hunting people who followed the buffalo on foot and periodically set fire to the prairie to aid them in their hunts. During the 18th century they made the transition to a horse culture and used firearms to a limited extent. After they were crowded out by white settlement, the Comanches continued to raid settlements in the county until the 1860s. There also appear to have been small numbers of Kiowa, Yojuane, Tawakoni, and Mayeye Indians living in the Travis and Williamson counties at the time of the earliest Anglo settlements. The prehistory of Texas has been studied by both professional and avocational archeologists for many decades. Pre-historic campsites are found throughout the county along streams or other water sources; most are "open occupation" sites, though caves and rockshelters are often found along various rivers and streams. When Europeans first arrived in the area, the Tonkawa tribe was the most prevalent, though the Comanches and Lipan Apaches were known to travel through the area as well. Spanish explorers, including the Espinosa-Olivares-Aguirre expedition, traveled through the area for centuries though few permanent settlements were created for some time. In the mid-18th century the San Xavier missions were established along the San Gabriel River in what is now western Milam County to facilitate exploration. In 1804 the fort Puesta del Colorado was established by the Spanish in what is now Bastrop. In 1807 the San Marcos de Neve settlement (modern San Marcos) was established on the San Marcos River. Following the independence of Mexico, of which Texas was a part, the empresario Stephen F. Austin issued grants to settlers in what is now Bastrop and Fayette Counties. During the mid-1820s settlements were established along the Colorado River near modern La Grange. The village of Mina (later renamed Bastrop) was established in 1827. Growth of the settlements was stagnant for some time because of conflicts with the Native Americans in the region. Nevertheless, the region sat along an important trade route known as the Camino Real de los Tejas, which ran from Mexico, though San Antonio and San Marcos, to Natchitoches. During the 1830s others, such as Martín Veramendi and Thomas G. McGehee, were issued land grants by the Mexican government to encourage settlement in the region. A string of forts was established east of modern Austin in what was then the western frontier. In 1835 Texans fought for independence in what was known as the Texas Revolution and won. Following independence other settlements were gradually established including Waterloo and Brushy Creek (modern Round Rock). In 1839 a commission appointed by Texas President Mirabeau B. Lamar selected Waterloo as the site for the new capital and the name Austin was chosen as the town's new name. In 1840 a series of conflicts between the Texas Rangers and the Comanches known as the Council House Fight and the Battle of Plum Creek finally pushed the Comanches westward mostly ending conflicts in Central Texas. Settlement in the area began to expand quickly. Travis County was established in 1840 and the surrounding counties were mostly established within the next two decades. New settlements were established such as Hamilton (now Burnet) in 1852. In 1861, with the outbreak of the American Civil War, voters in Austin, Bastrop, and other Central Texas communities and counties voted against secession. However, as the war progressed and fears of attack by Union forces increased, the communities contributed hundreds of men to the Confederate forces. With the end of the war and the emancipation of Texas slaves, the African American population of the area swelled dramatically. Black communities such as Wheatville, Pleasant Hill, and Clarksville were established around Austin by these newcomers. The postwar period saw dramatic population and economic growth. The town of Bastrop became a significant manufacturing center producing iron, coal, and textiles. The Chisolm Trail, one of the major routes for exporting cattle, passed through the region. The opening of the Houston and Texas Central Railway, connecting Austin with Houston, transformed Austin into the major trading center for the region. However, as new railroads were built through the region in the 1870s, Round Rock and other communities took over much of Austin's role as a trading center. In 1868 the Coronal Institute was established in San Marcos and in 1873 Texas University (later renamed Southwestern University) was opened in Georgetown following the consolidation of five earlier colleges. During the 1880s Austin gained new prominence as the state capitol building was constructed and other universities were established in the area, most notably the University of Texas. Cattle and cotton production were major economic drivers for many outlying communities. In the late 19th century Austin expanded its city limits to more than three times its former area and the Austin Dam was built to power a new street car line and the new municipal water system. In the early 20th century the Texas Oil Boom took hold creating tremendous economic opportunities in Southeast Texas and North Texas. The growth generated by this boom largely passed by Austin at first, with the city slipping from 4th largest to 10th largest in Texas between 1880 and 1920. Bastrop, however, became a significant center for oil drilling and coal mining in the early-to-mid-20th century. San Marcos, and some other communities, established significant manufacturing operations during the world wars substantially diversifying their economies. Beginning in the 1920s and 1930s, Austin launched a series of civic development and beautification projects that created much of the city's infrastructure and parks. In addition, the state legislature established the Lower Colorado River Authority that, along with the City of Austin, created the system of dams along the Colorado River that formed the Highland Lakes. These projects were enabled in large part by the fact that Austin received more Depression era relief funds than any other Texas city. During the mid- and later 20th century, Austin became firmly established as the major metropolitan center of what is now Greater Austin. Communities such as Round Rock, Georgetown, and San Marcos increasingly became attractive bedroom communities for Austin, even as each of these communities has maintained its own economic core as well./. In the late 20th century, the face of the Austin community was changing rapidly. 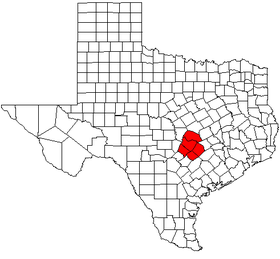 Greater Austin is located in Central Texas along the Balcones Fault and Interstate 35, northeast of San Antonio. As a result of its straddling the Balcones Fault the eastern part of the city is flat, whereas the western part and western suburbs consist of rolling hills on the edge of the Texas Hill Country. 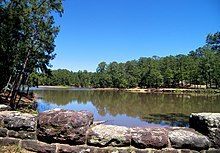 The region is crossed by the Colorado River with several man-made lakes, known as the Highland Lakes, along its length. Because the hills to the west are primarily limestone rock with a thin covering of topsoil, the western portions of the area are frequently subjected to flash floods from the runoff caused by thunderstorms. To help control this runoff and to generate hydroelectric power, the Lower Colorado River Authority operates a series of dams that form the lakes. The Austin area is located at the intersection of four major ecological regions and is consequently a temperate-to-hot green oasis with a highly variable climate having some characteristics of the desert, the tropics, and a wetter climate. The area is very diverse ecologically and biologically, and is home to a variety of animals and plants. The soils of Central Texas range from shallow, gravelly clay loams over limestone in the western outskirts to deep, fine sandy loams, silty clay loams, silty clays or clays in the city's eastern part. Some of the clays have pronounced shrink-swell properties and are difficult to work under most moisture conditions. Many of Austin's soils, especially the clay-rich types, are slightly to moderately alkaline and have free calcium carbonate. Greater Austin has a humid subtropical climate, characterized by hot summers and mild winters. On average, the City of Austin receives 33.6 inches (853.4 mm) of rain per year, with most of the precipitation in the spring, and a secondary maximum in the fall. To the east, away from the Hill Country, precipitation is typically higher. For example, Bastrop receives an average of 38.0 inches (965.2 mm) of rain per year. During springtime, severe thunderstorms sometimes occur, though tornados are rare in the city. Austin is usually at least partially sunny. Central Texas summers are usually hot and humid, with average temperatures of approximately 90 degrees Fahrenheit (32 Celsius) from June until September. Temperatures above 100 °F (38 °C) are common. For the entire year there is an average of 111 days above 90 °F (32 °C) and 198 days above 80 °F (27 °C) in the City of Austin. In general temperatures are somewhat cooler to the west in the Hill Country than in the plains to the east. The average August high temperature in Marble Falls is 94 °F (34 °C) compared to 96 °F (36 °C) in Bastrop, and the average January low in Marble Falls is 33 °F (1 °C) compared to 37 °F (3 °C) in Bastrop. Winters in the Austin area are mild and dry. For the entire year, Austin averages 88 days below 45 °F (7 °C) and 24 days when the minimum temperature falls below freezing. Snowfall is rare in Central Texas, but the area suffers occasional ice storms each year that freeze over roads and can affect parts of the region for as much as 48 hours or more. Greater Austin has a diverse economy heavily anchored by government activities and education. High-tech firms, particularly related to semiconductors and software, are also important economic pillars. The five-county MSA had a gross domestic product of $90.9 billion in 2011, making it the 35th largest metropolitan economy in the U.S. Most of the area's largest employers are all within the City of Austin. These include Advanced Micro Devices, Apple, Inc., Austin Independent School District, the City of Austin, Freescale Semiconductor, IBM, Seton Healthcare Network, the Texas Government, the United States Government, and the University of Texas at Austin. Major employers outside of Austin include Dell (Round Rock), MD/Totco in Cedar Park (a division of National Oilwell Varco), Southwestern University in Georgetown, and Texas State University in San Marcos. The principal highways in the metropolitan area are Interstate 35 and the MoPac Expressway (State Highway Loop 1), both of which are the primary North/South roadways. Other important arteries in the city and its immediate vicinity are U.S. Highway 183 (also known as "Research Blvd. "), and U.S. Highway 290 which provide East/West thoroughfares. Other important highways include State Highway 71 (also known as "Ben White Blvd.") which connects Austin with Houston to the south, and to Marble Falls and the Highland Lakes chain to the west. And State Highway Loop 360 is a scenic highway which runs to the North/South on the west side of Austin but curves westward into the hills. Loop 360 carries special scenic zoning as well preventing billboards and minimizing views of the surrounding buildings. Austin's new toll roads include State Highway 130, U.S. Highway 183-A, and State Highway 45 discussed below. Interstate 10 also runs through the extreme southern portion of Caldwell County. In November 2006, the Central Texas Regional Mobility Authority (CTRMA) opened the first segment of the region's first toll road system. Both State Highway 130 and State Highway 45 toll roads run through portions of Austin and provide greatly increased mobility to the city. State Highway 130 prior to 2013 ran just south of Austin Bergstrom International Airport at US Highway 183 and ended at Interstate 35 north of Georgetown. It provides mobility and access to the easternmost part of Austin and Travis County, and allows residents in Williamson County easy access to the airport. This project, completed in October 2012, now ends at Interstate 10 just east of Seguin, about 30 miles east-northeast of San Antonio. The speed limit on the newly completed stretch is the highest in the United States at 85 mph (137 km/h). State Highway 45 is part of an eventual partial loop that runs east from U.S. Highway 183 in Cedar Park to State Highway 130 at Pflugerville (east of Round Rock) where it merges with the SH 130 toll road, and then intersects with the southern portion of SH 45 near Buda, south of Austin. SH 45 is one of the very few East/West connectors in Austin, but it also connects to a tolled extension of Loop 1 (also known locally as the "Mopac Expressway") and allows direct access from to I-35 to Loop 1 by use of flyover connections rather than ground level intersections. The toll roads also provide access to the Dell headquarters and its approximately 16,000 employees. Despite the overwhelming initial opposition to the toll road concept, both toll roads have improved mobility in and around the Austin area and are significantly exceeding their revenue projections. The metro area is served by buses of the Capital Metropolitan Transportation Authority (Capital Metro). Capital Metro operates 48 fixed-route, 1 flex-route, and eight express bus services within the city of Austin and several nearby suburbs in Travis and Williamson counties. Capital Metro also operates the shuttles of the University of Texas, which provides limited-stop services to and from neighborhoods where many university students reside. A commuter rail service—the Red line of Capital MetroRail—began service on 22 March 2010, connecting Downtown Austin with the city of Leander. The region's primary airport is Austin-Bergstrom International Airport. In 2000, U.S. Census Bureau estimated that in the Austin–Round Rock–San Marcos MSA there were 1,249,763 people, 471,855 households, and 295,781 families. The racial makeup of the metropolitan area was 72.5% White, 8.0% African American, 0.6% Native American, 3.5% Asian, 0.1% Pacific Islander, 12.8% from other races, and 2.6% from two or more races. Hispanic or Latino of any race were 26.2% of the population. As of 2010[update], U.S. Census Bureau estimated that in the Austin–Round Rock–San Marcos MSA there were 1,719,289 people. The racial makeup of the metropolitan area was 72.9% White, 7.4% African American, 0.8% Native American, 4.8% Asian, 0.1% Pacific Islander, 10.9% from other races, and 3.2% from two or more races. Hispanic or Latino of any race were 31.4% of the population. The median income for a household in the MSA was $46,512 and the median income for a family was $54,361. Males had a median income of $35,612 versus $27,095 for females. The per capita income for the MSA was $20,721. As of 2014[update], the U.S. Census Bureau estimated the population of the Austin–Round Rock MSA had increased to 1,943,299. In 2010, the urban area population (as defined by the Census Bureau) was estimated to be 1,362,416 while the 2013 population of Austin proper estimated at 885,400. The region contains numerous universities. Major area universities include the University of Texas at Austin (flagship of the University of Texas System), Texas State University, and Southwestern University (Georgetown). The city of Austin itself contains numerous other institutions of higher education including Austin Presbyterian Theological Seminary, Concordia University, Huston-Tillotson University, St. Edward's University, and others. Additional institutions in the suburban communities include Temple College in Taylor and the Texas State University extension in Round Rock. In 2006, 35% of adults in the City of Austin held college degrees, placing fourth among the 77 largest cities in the U.S. As of 2010[update] this percentage had climbed to 43.3%. In Round Rock 37.2% of adults held degrees, in Pflugerville 40.50% held degrees, in Cedar Park 39.1% held degrees, and in San Marcos 34.1% held degrees. This compares to 23.2% for all of Texas and 24.4% for the entire U.S. making the Austin area one of the most educated metropolitan areas in the U.S. The region is served by numerous school districts. As of 2010[update] the Greater Austin Chamber of Commerce lists 29 public school districts, 17 charter schools, and 69 private schools. The Chamber lists as the primary districts Austin ISD, Bastrop ISD, Del Valle ISD, Eanes ISD, Georgetown ISD, Hays CISD, Lake Travis ISD, Leander ISD, Pflugerville ISD, and Round Rock ISD. Adding to this list the San Marcos Consolidated Independent School District, there are a total of 11 core districts. As of 2009[update] the Texas Education Agency ranks one district, Eanes, as "Exemplary", the highest rating. Three districts, Del Valle, Leander, and Round Rock, are ranked as "Recognized", the second highest rating. All of the others are ranked as "Academically Acceptable". These 12 districts operate 330 individual schools. Of these schools 98 (30%) are ranked as "Exemplary", and 87 (26%) are ranked as "Recognized". Major private schools in the area include Redeemer Lutheran School, Brentwood Christian School, Hill Country Christian School, Hyde Park Baptist School, the Regents School, Round Rock Christian Academy (Round Rock), Summit Christian Academy (Leander), St. Andrew's Episcopal School, and St. Michael's Academy. The communities in Greater Austin hold many annual events. In Austin two of the most well known festivals are the South by Southwest Music and Film Festival and the Austin City Limits Music Festival, which draw artists and spectators from around the world. Many other Austin festivals take place including the Old Pecan Street Festival, Blues on the Green, and the Laguna Gloria Art Museum Fiesta. The Texas Hill Country Wine and Food Festival is centered in Austin but takes place at restaurants and venues in multiple communities. Outside of Austin many communities host local events of their own. Marble Falls hosts the Bluebonnet Blues and Fine Arts Festival, an event that attracts artists and performers from around the state to the community's downtown. Burnet hosts the Spring Bluebonnet Festival, which features a golf tournament, car shows, vintage airplane shows, and other activities. The Old Settler's Music Festival in Driftwood features live outdoor performances ranging from folk music to bluegrass and jazz. Some area communities host civic heritage festivals including the Cedar Park Heritage Festival and the Chisolm Trail Round Up in Lockhart. The Oktoberfest celebration in Fredericksburg is one of the largest and most traditional in Texas. Rodeo fairs occur annually including the Star of Texas Fair and Rodeo and the Burnet Rodeo. Austin has adopted the nickname "Live Music Capital of the World" based on its claim of having the highest percentage of music performers of any other major city. The city has a variety of venues for live music performance of popular and country music including famous clubs such as Antone's and Emo's. The long-running television program Austin City Limits has for decades showcased the city's music scene, as has the South by Southwest festival and other events in the city. Apart from these the city hosts major classical music performances via the Austin Lyric Opera and the Austin Symphony Orchestra. Other communities in the Austin Area host their own music venues and organizations as well. The Williamson County Symphony Orchestra, founded in 2002, offers performances at locations throughout the county. The Starlight Symphony, a community orchestra, offers performances at various venues within the southwestern areas of Greater Austin including San Marcos, Dripping Springs, and Johnson City. The Round Rock Symphony, a recently established organization, offers performances within Round Rock. The Austin metropolitan area has no major-league professional sports teams (making it the largest market in North America not to have any such franchises), but is home to several minor-league teams, as well as the Texas Longhorns collegiate sports programs and the Circuit of the Americas motor-racing circuit. Regional professional sports clubs include the Round Rock Express in AAA baseball, the Texas Stars in AHL hockey, the Austin Spurs in G-League basketball, the Austin Aztex in USL soccer, the Austin Outlaws in WFA football, and the Austin Aces in WTT tennis. In professional motorsport, the Circuit of the Americas hosts the United States Grand Prix and the Motorcycle Grand Prix of the Americas, as well as the X Games. Austin also hosts the Texas Rollergirls flat-track roller derby league. The region is also home to several endurance and multi-sport race events, including the Austin Marathon, the Capitol 10K race, and the Capital of Texas Triathlon. Sizeable running, swimming and bicycling communities make use of a network of trails and greenbelts centered on the Lady Bird Lake Hike and Bike Trail and local pools like Barton Springs Pool. The Austin area has long been known for its outdoor attractions and is home to numerous parks and nature preserves. Major parks within the City of Austin include McKinney Falls State Park, Emma Long Metropolitan Park, Zilker Park, and Hippie Hollow Park. Mount Bonnell Park is a popular destination, located at one of the highest points in the city. Outside of the Austin various other parks, including Bastrop State Park, Lockhart State Park, and Longhorn Cavern State Park, are available. Further from the area's core is the Enchanted Rock State Natural Area, a 640-acre (260 ha) park near Fredericksburg featuring a large granite mound that is popular with hikers and climbers. Additionally Pedernales Falls State Park in Johnson City, and Inks Lake State Park in Burnet, are among the many other parks available in Central Texas. The largest nature preserve in the area is the Balcones Canyonlands National Wildlife Refuge, a preserve northwest of Austin near Burnet and Marble Falls comprising 21,436 acres (8,675 ha). Other preserves in the area include the Wild Basin Wilderness Preserve, the Indiangrass Wildlife Sanctuary, and the Onion Creek Wildlife Sanctuary. These preserves are all part of the Heart of Texas Wildlife Trail, a network of trails and sites for viewing wildlife habitats, created by the Texas Parks and Wildlife Department. Austin's Chinatown (Chinese: 奥斯汀唐人街; pinyin: Àosītīng tángrénjiē), established in 2006, is located at 10901 N. Lamar Blvd., and features top reviewed restaurants and supermarkets according to an article by the Austin Chronicle. According to Cam Rossie and Hilary Hylton, Austin's Chinatown is a series of stores anchored by a supermarket called "MT Supermarket." ^ "Revised Delineations of Metropolitan Statistical Areas, Micropolitan Statistical Areas, and Combined Statistical Areas, and Guidance on Uses of the Delineations of These Areas" (PDF). Office of Management and Budget. 28 February 2013. Archived from the original (PDF) on 19 March 2013. ^ a b "Table 1. With current growth patterns, Greater Austin is expected to reach nearly 2 million people by 2015. Annual Estimates of the Population of Metropolitan and Micropolitan Statistical Areas: April 1, 2000 to July 1, 2009 (CBSA-EST2008-01)". 2009 Population Estimates. United States Census Bureau, Population Division. 23 March 2010. Archived from the original (CSV) on 15 June 2010. Retrieved 23 March 2010. ^ "Capital Area Council of Governments". Capital Area Council of Governments. Archived from the original on 23 April 2009. Retrieved 16 February 2010. ^ Andrea Ball (12 December 2007). "Know a fabulous woman?". Austin American Statesman. Archived from the original on 12 February 2008. "Women of Distinction Luncheon-Austin Area". Girl Scouts of Central Texas. Retrieved 15 February 2010. ^ a b c d e f "U.S. Census Bureau QuickFacts selected: San Marcos city, Texas; Georgetown city, Texas; Kyle city, Texas; Austin city, Texas; Round Rock city, Texas; Cedar Park city, Texas". www.census.gov. Retrieved 7 August 2017. ^ a b "U.S. Census Bureau QuickFacts selected: Leander city, Texas; Pflugerville city, Texas". www.census.gov. Retrieved 7 August 2017. 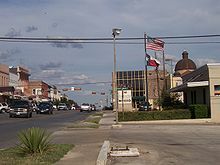 ^ "U.S. Census Bureau QuickFacts selected: Hutto city, Texas". www.census.gov. Retrieved 7 August 2017. ^ Hylton (2006), p. 236, 370. ^ a b c Odintz, Mark: Williamson County from the Handbook of Texas Online. Retrieved 17 February 2010. Texas State Historical Association. ^ SUE, HESTER, THOMAS R. AND TURNER, ELLEN (15 June 2010). "PREHISTORY". www.tshaonline.org. Retrieved 3 May 2017. ^ "City of Austin - Austin History Center: What Native American tribe was most common in the area?". 5 October 2001. Archived from the original on 5 October 2001. Retrieved 3 May 2017. ^ a b c Cecil, Paul F.; Greene, Daniel P.: Hays County from the Handbook of Texas Online. Retrieved 17 February 2010. Texas State Historical Association. ^ a b c d e Marks, Paula Mitchell: Bastrop, Texas from the Handbook of Texas Online. Retrieved 17 February 2010. Texas State Historical Association. ^ Garrett, Daphne Dalton: Fayette County from the Handbook of Texas Online. Retrieved 17 February 2010. Texas State Historical Association. ^ "El Camino Real de los Tejas Historic Trail". El Camino Real Trail Partners. Retrieved 12 March 2010. ^ a b Smyrl, Vivian Elizabeth: Travis County from the Handbook of Texas Online. Retrieved 17 February 2010. Texas State Historical Association. ^ Waterloo, Texas from the Handbook of Texas Online. Retrieved 17 February 2010. Texas State Historical Association. ^ Plum Creek, Battle of from the Handbook of Texas Online. Retrieved 17 February 2010. Texas State Historical Association. 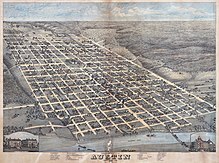 ^ a b c d e f g h Humphrey, David C.: Austin, Texas from the Handbook of Texas Online. Retrieved 17 February 2010. Texas State Historical Association. ^ Scarbrough, Clara Stearns: Round Rock, Texas from the Handbook of Texas Online. Retrieved 17 February 2010. Texas State Historical Association. ^ Young, Nancy Beck: Coronal Institute from the Handbook of Texas Online. Retrieved 25 February 2010. Texas State Historical Association. ^ Lansford, Edwin M. Jr.: Southwestern University from the Handbook of Texas Online. Retrieved 25 February 2010. Texas State Historical Association. ^ a b c Greene, Daniel P.: San Marcos, Texas from the Handbook of Texas Online. Retrieved 25 February 2010. Texas State Historical Association. ^ "Top Hipster Neighborhoods in Austin". 7 April 2014. Retrieved 3 May 2017. ^ "15 Most Hipster Cities In The World". 14 June 2014. Retrieved 3 May 2017. ^ Jordan, Terry G.: Hill Country from the Handbook of Texas Online. Retrieved 7 November 2009. Texas State Historical Association. ^ "Watches and warnings". News 8 Austin. Retrieved 7 February 2010. ^ McCann, William: Lower Colorado River Authority from the Handbook of Texas Online. Retrieved 7 February 2010. Texas State Historical Association. "Austin Climate Summary" (PDF). NOAA. Retrieved 7 February 2010. "Austin Texas Weather Patterns". Visiting Austin Texas. Retrieved 7 February 2010. ^ Nora Fowler; School of Biological Sciences. "Geology (Edward's Plateau Ecology)". University of Texas at Austin. Retrieved 7 February 2010. ^ a b c d "Austin Weather & Climate". About.com. Archived from the original on 18 January 2007. Retrieved 19 March 2007. ^ a b "MontAverages". Weather.com. Retrieved 13 July 2006. ^ a b "Monthly Averages for Bastrop, TX". Weather.com. Retrieved 16 February 2010. ^ "VERY HOT EARLY SEPTEMBER 2000 WEATHER". National Weather Service. Archived from the original on 3 January 2008. Retrieved 19 March 2007. ^ "Monthly Averages for Marble Falls, TX". Weather.com. Retrieved 16 February 2010. ^ "NowData - NOAA Online Weather Data". National Oceanic and Atmospheric Administration. Retrieved 20 June 2016. ^ "Station Name: TX AUSTIN-CAMP MABRY". National Oceanic & Atmospheric Administration. Retrieved 27 March 2014. ^ "WMO Climate Normals for AUSTIN/MUNICIPAL AP TX 1961–1990". National Oceanic and Atmospheric Administration. Retrieved 10 March 2014. ^ "Normals for Austin, Texas". The Weather Channel. Retrieved 13 July 2006. ^ a b "Greater Austin Regional Guide" (PDF). Archived from the original (PDF) on 3 May 2006. Retrieved 17 February 2010. ^ "GDP by MSA". Greyhill Advisors. Retrieved 23 June 2013. ^ Shiffler, D.Ann (26 September 2003). "On the road again". Austin Business Journal. ^ Hall, Christine. "Cyberstates: Texas second-largest tech employment." Austin Business Journal. Wednesday 28 April 2010. Retrieved 4 May 2010. ^ Wear, Ben (28 September 2009). "Positive signs for financial future of Texas 130;". Austin American-Statesman. pp. B–1. Retrieved 7 August 2010. Report on the tollway...has been making more money than projected. ^ "Capital MetroRail Rolls Out Service". Capital Metro. Archived from the original on 29 March 2010. Retrieved 23 March 2010. ^ Texas Almanac: City Population History from 1850–2000. Population 1850–2000 (PDF).Texas Almanac. Retrieved June 20, 2014. ^ "Population Densities". U.S. Census Bureau. Archived from the original on 13 June 2012. Retrieved 17 February 2010. ^ "FactFinder". U.S. Census Bureau. Retrieved 23 March 2010. ^ Hylton (2006), p. 3. ^ "Best Places: Round Rock, TX". U.S. News and World Report. Archived from the original on 31 January 2010. Retrieved 17 February 2010. "Best Places: Cedar Park, TX". U.S. News and World Report. Archived from the original on 13 December 2009. Retrieved 17 February 2010. "Best Places: San Marcos, TX". U.S. News and World Report. Archived from the original on 31 January 2010. Retrieved 17 February 2010. "Best Places: Pflugerville, TX". U.S. News and World Report. Archived from the original on 29 January 2010. Retrieved 18 February 2010. ^ "State & County QuickFacts: Texas". U.S. Census Bureau. Archived from the original on 23 October 2013. Retrieved 17 February 2010. ^ Urban Land Institute (1995), p. 13. ^ "Education". Greater Austin Chamber of Commerce. 16 February 2010. Archived from the original on 21 November 2008. ^ "Quick Facts". Greater Austin Chamber of Commerce. Archived from the original on 21 November 2008. Retrieved 16 February 2010. ^ "2009 Accountability System: List by District". Texas Education Agency. Archived from the original on 5 December 2009. Retrieved 16 February 2010. ^ "Private Elementary & Secondary Schools in the Austin MSA" (PDF). Greater Austin Chamber of Commerce. 18 March 2018. ^ "Arts and Entertainment". Greater Austin Chamber of Commerce. Archived from the original on 4 January 2010. Retrieved 17 February 2010. ^ Hylton (2006), p. 219. ^ Hylton (2006), p. 217. ^ Hylton (2006), p. 218. ^ "Heritage Fest and Parade". City of Cedar Park, TX. Archived from the original on 13 April 2010. Retrieved 17 February 2010. ^ "Chisolm Trail Round Up". Lockhart Chamber of Commerce. Archived from the original on 15 June 2009. Retrieved 17 February 2010. ^ Hylton (2006), p. 228. ^ "Austin: Live Music Capital of the World". City of Austin, Texas. Retrieved 17 February 2010. ^ "Williamson County Symphony Orchestra". Williamson County Symphony Orchestra. Retrieved 17 February 2010. ^ "Starlight Symphony opens new season at FBC in Wimberley". San Marcos Record. 13 October 2009. Archived from the original on 27 September 2011. ^ Pulsifer, Eric (5 September 2008). "Round Rock Symphony Share". Community Impact Newspaper (Round Rock, Pflugerville). Archived from the original on 13 July 2011. ^ "Prescribed Burning at Balcones Canyonlands National Wildlife Refuge". U.S. Fish and Wildlife Service. Archived from the original on 9 April 2010. Retrieved 17 February 2010. ^ "Fortune Chinese Seafood Restaurant". ^ "Austin - Page 158". Hylton, Hilary; Rossie, Cam (2006). Insiders' Guide to Austin (5th ed.). Guilford, CT: Globe Pequot. ISBN 978-0-7627-4041-3. Kincannon, Charles Louis, ed. (October 2002). Census of population and housing (2000): Texas Summary Population and Housing Characteristics. U.S. Census Bureau, U.S. Dept. of Commerce. ISBN 978-1-4289-8674-9. ULI market profiles: North America. 3. Urban Land Institute. 1995. ISBN 978-99959-776-3-4.